Not So Basic Grupple, a sheer light grey base packed with different size blue and silver glitter. The formula is good. The glitter spreads easily and don’t stick together. I used one coat over a greyish blue base (ANNY Blue fashion show). 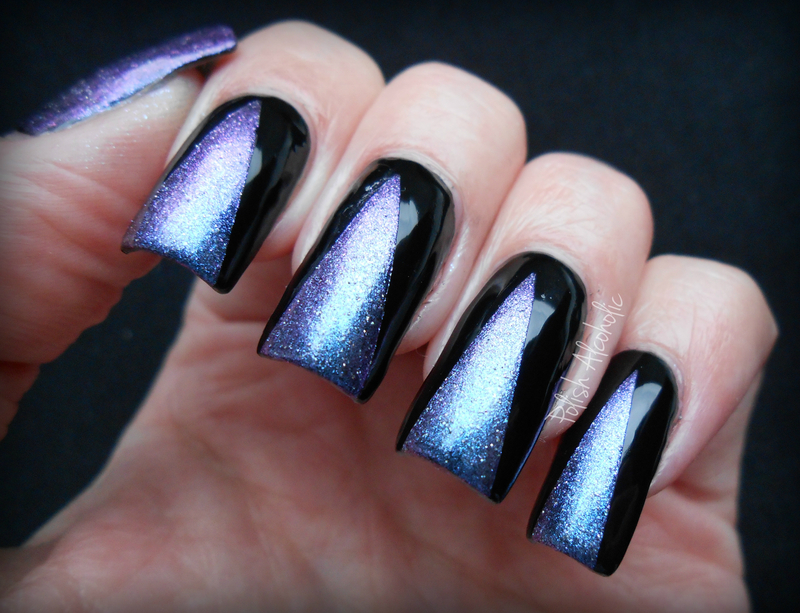 Night Fall, a steel grey duochrome that shifts from blue to purple and even pink. As with most duochromes I had a hard time photographing the color shifting 😦 I created a triangle french tip by using two thin coats of Night Fall over a black base (China Glaze Liquid Leather). Cotton Candy, a clear base packed with different size and color glitter. A true glitterbomb! I created a gradient by slightly dabbing Cotton Candy over China Glaze’s Tart-y for the party. Color Of The Year, a vibrant green cream with blue and purple shimmer. This one has a fantastic formula! This is two easy coats on its own. What do you think of these? Any favorites? Don’t forget to like Piper Polish’s Facebook page! 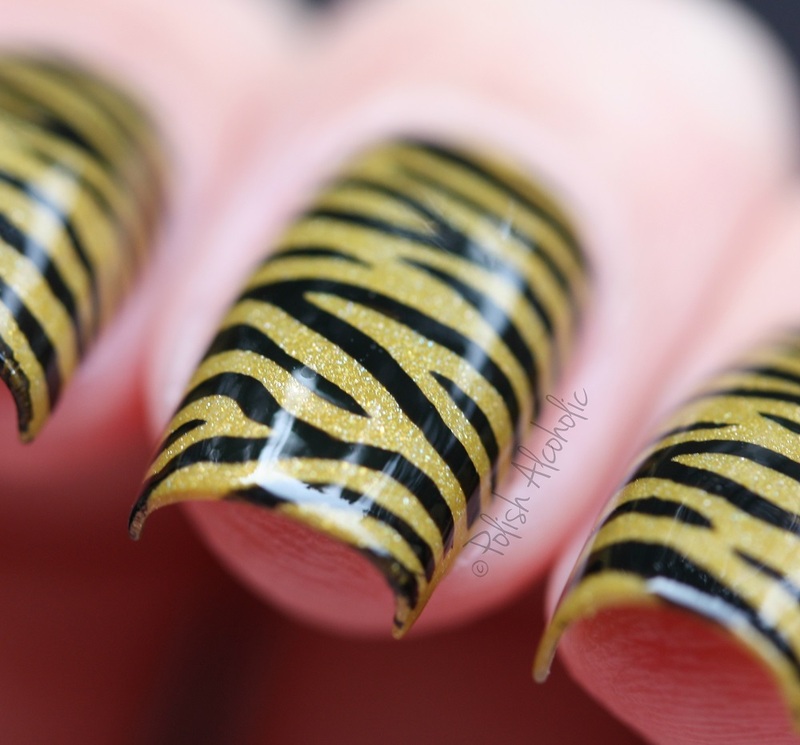 Here are three creations by Celena, the founder of Canvas Nails. All swatches have a base- and top coat. Pictures are taken in daylight. Emerald City, a mix of very fine green and blue glitter swimming in a clear base. The formula is very dense. I think this could be worn on it’s own in three coats. The application went flawless. I created a gradient over a minty green base (W.I.C. by Herôme Essaouira). 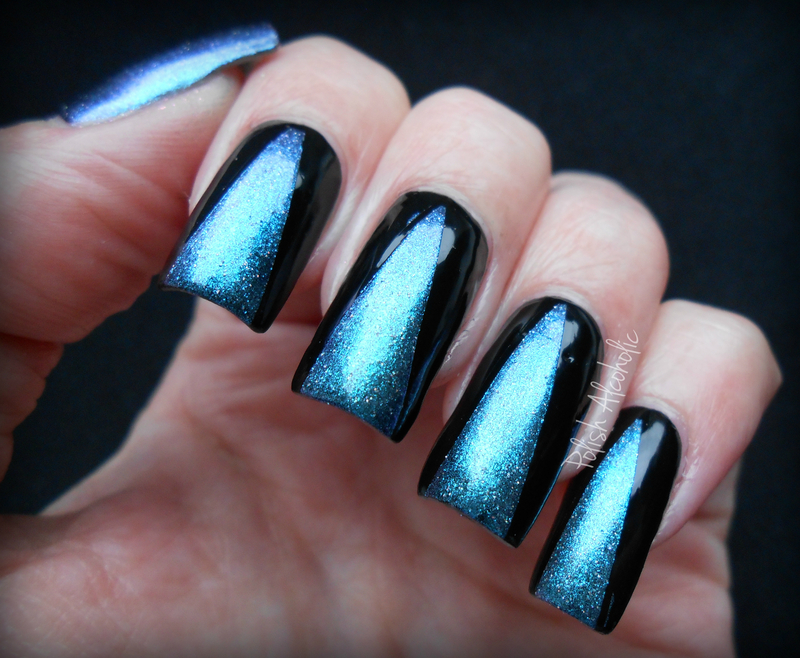 Sky Blue, a mix of blue and silver fine glitter. It has the same consistency as Emerald City. Very easy to work with! I created a gradient over a bright blue base (ANNY Poolgirl). Good to know: Canvas Nails polishes are 3 free which means it does not contain the toxic chemicals DBP, Formaldehyde and Toluene. Check out all of Celena’s creations at her Etsy shop. You can get a full size bottle of awesomeness for $8.00/€ 6,25! If you’d like to add (one of) the creations shown above, make sure you’ll get it asap! There is still only one of each available! Today I have another indie brand to show you: Indigo Bananas (awesome name ha)! 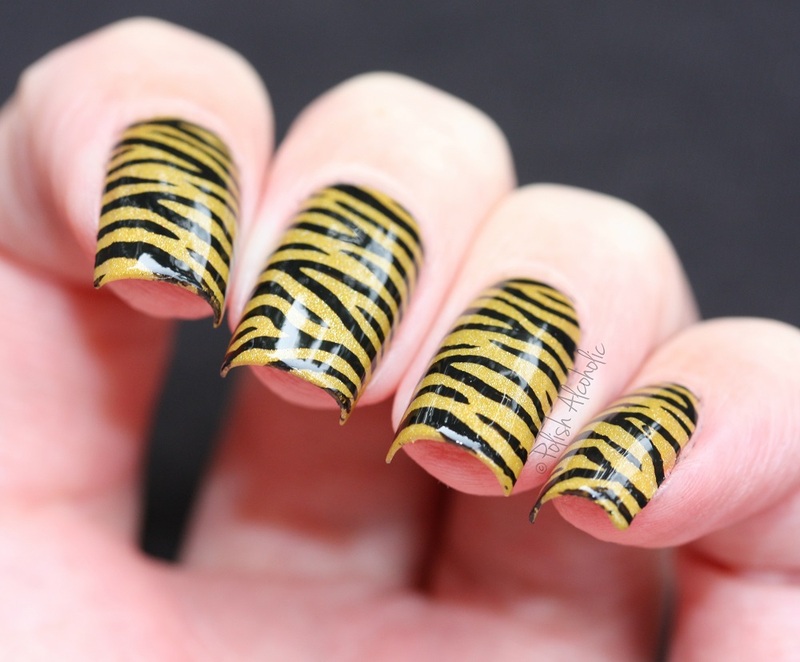 “Indigo Bananas is a handmade, indie nail polish brand that launched February 2013. IB has been in the works since late May 2012, and many of the launch colors date back to the summer of ‘12 in terms of development. Currently, Indigo Bananas is only Etsy based, but accepts both Paypal & Credit Cards on there. 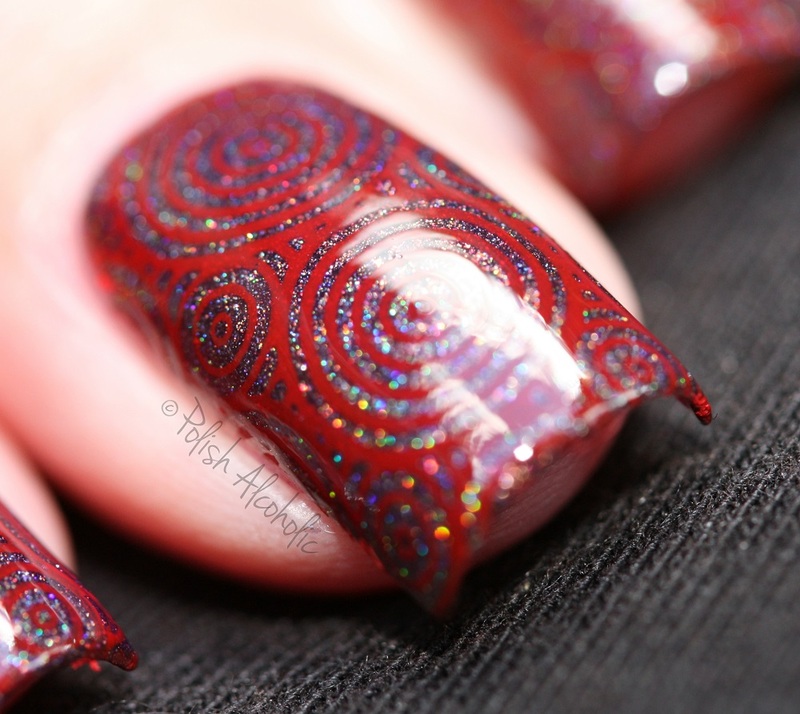 I (Andrea) first got into polish mixing, or rather ‘collect all the glitters and pigments that you can lay your eyes on’ in April/May of 2012. Back then I got sidetracked by trying to make my own suspension base (partially, at least from top coats – doing it from scratch requires a hazmat license & full chem lab) for a while, but went full steam ahead on ‘buy ALL THE (glitter and pigment) COLORS’ by May 2012. I’ve been working on the current set of launch colors since June or so for many of them, and have made nearly two hundred proper polishes (not frankens really, but from base & pigments) since then. My background’s in biology at the PhD level, with undergrad training in ecology, molecular bio & chemistry, so my interest in this all stemmed from a love of deconstructing what went into nail polish at the chemical level. So: a love of pigments (especially duochromes) and the chemistry behind it and a passion for making terrible, awful jokes led to Indigo Bananas as you see it now. Scroll down for swatches of three of the large range of their duochromes. 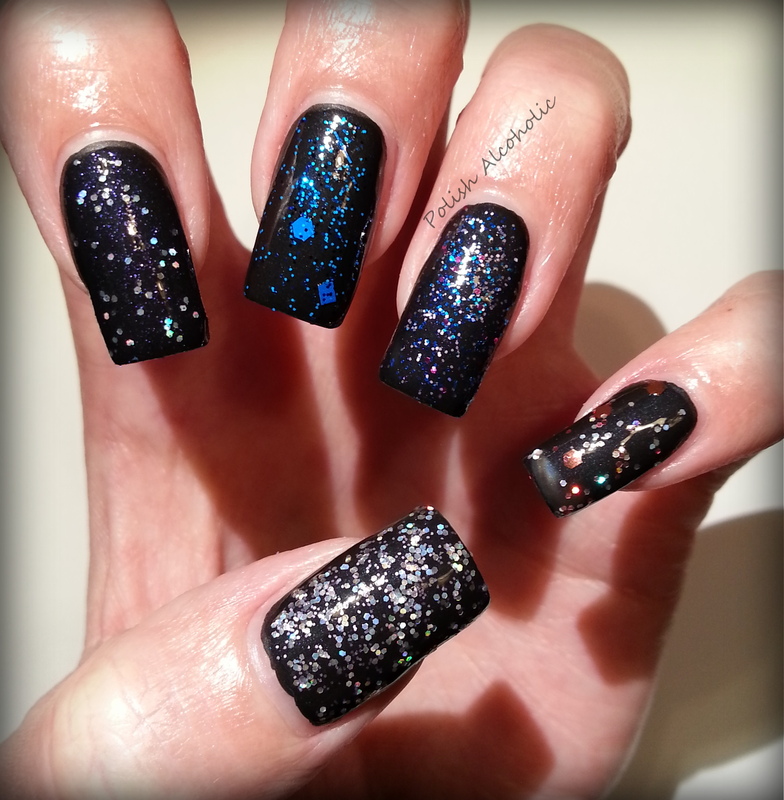 All of the swatches are just one coat over a black base and topped off with top coat (Seche Vite). Eris, a duochrome that shifts from lavender to pink. 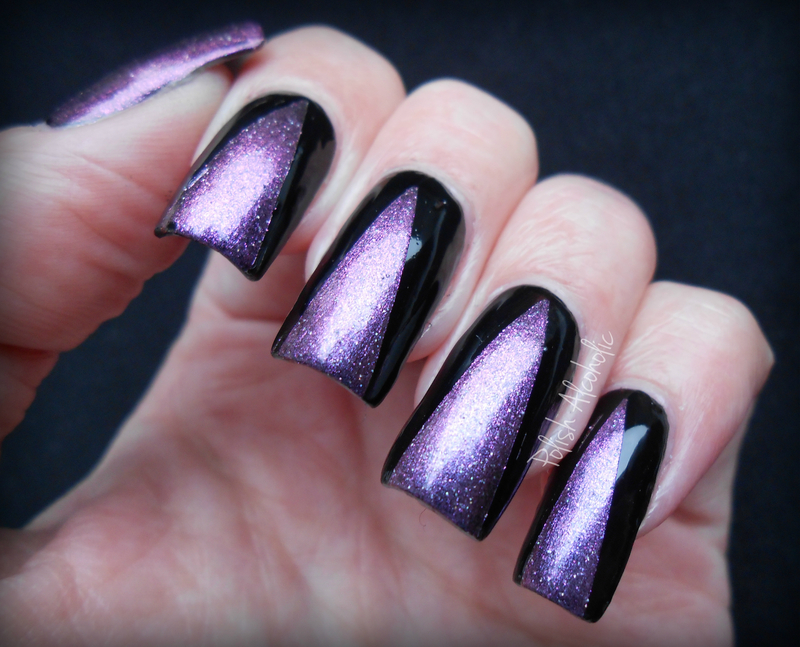 This duochrome is called Hermes and shifts from blue to purple (with slight green undertones). Maui shifts from teal blue to purple (with green undertones). Well, first of all I love these duochromes! Every single one of them. They are such eye catchers. I had a difficult time capturing the color shifting on camera (even after tons of pics from different angles).That is such a pity because it’s stunning! I love how duochromes ‘pop’ when layered over a black base. But these babies can also be worn on their own. Then they will require three coats though. Indigo Bananas really stand out for their large collection of duochromes! The formula of all of these is great and easy to work with. I can’t wait to try Shadow and Pan. 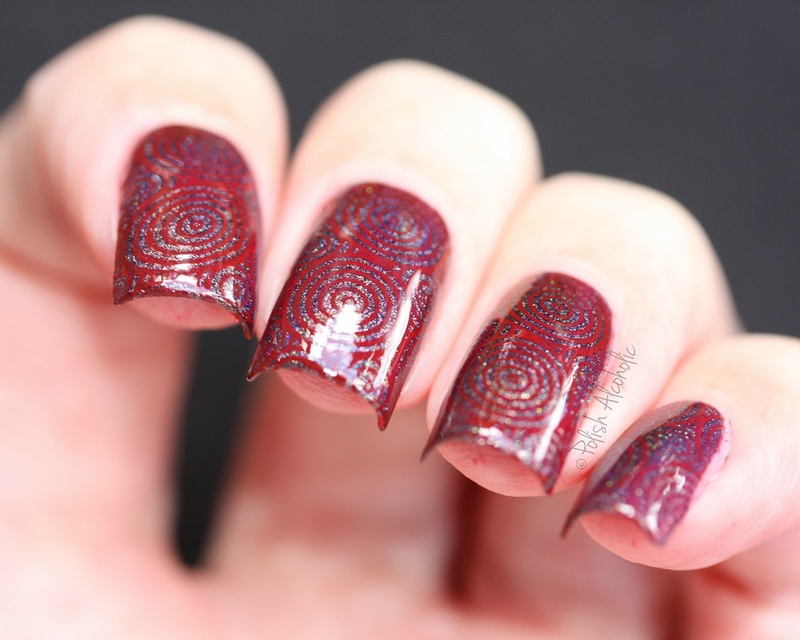 Oh and -as a holo addict- I just need to have the Spectraflair top coat! How about you? Anything that catches you eye? Indigo Bananas polishes are available at Andrea’s Etsy shop (15 ml: $10.00/€7,85 5 ml: $4.50/€3,53). Keep up to date for giveaways, feedback and contest by liking their Facebook page. And you might want to check out Indigo Bananas’ website! 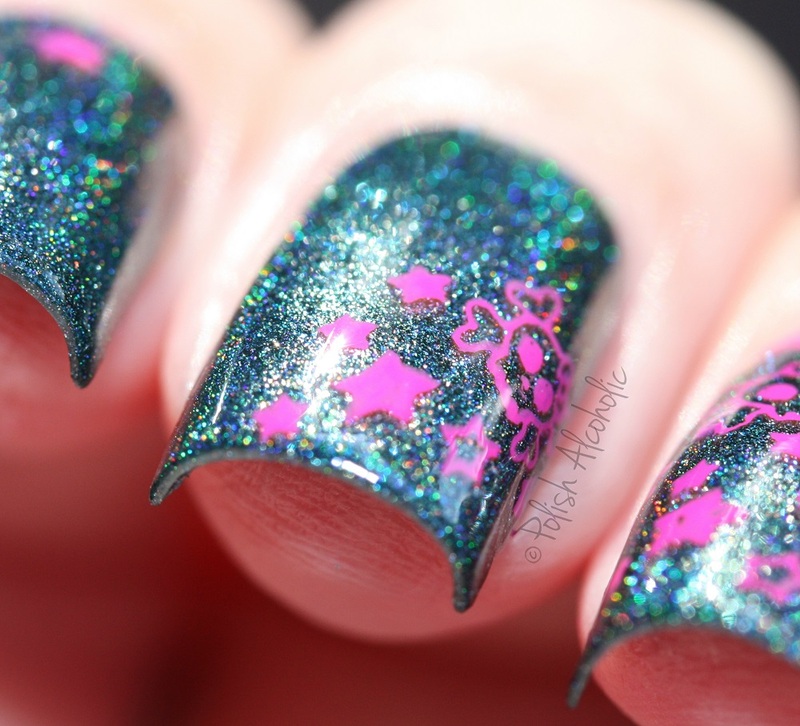 Darling Diva Polish is a creation by Carrie. Today I will show you five gorgeous must have shades of her newest line. All photo’s are taken in daylight to get the most color accurate photo’s. Flirt, a soft green linear holographic with tiny green iridescent glitters. The formula is great and easy to work with. I’ve used three thin coats plus top coat. The tiny glitters in this polish gives it a bit extra bling. Great shade for Spring huh! Glacier is the blue version of Flirt. As with Flirt, the formula is great to work with. I’ve used three thin coats plus top coat. Sugar Rush is ment to be layered. You will find translucent larger neon hexes, medium translucent neon hexes, iridescent square glitters, and a touch of silver holographic powder in a clear base. As with most glitter polishes I needed to do some fishing and replacing of the hexes. The formula is surprisingly easy to work with. It needs two coats of top coat to get a smooth finish. This polish makes me think of candy. I like it! Wardrobe Malfunction is the soft ‘blurple’ sister of Peonie and is formula wise the same. Love this! I love every single one of these polishes. The formula of all of them is a dream and dries very quick. Except from Sugar Rush, you can easily get away with two coats. 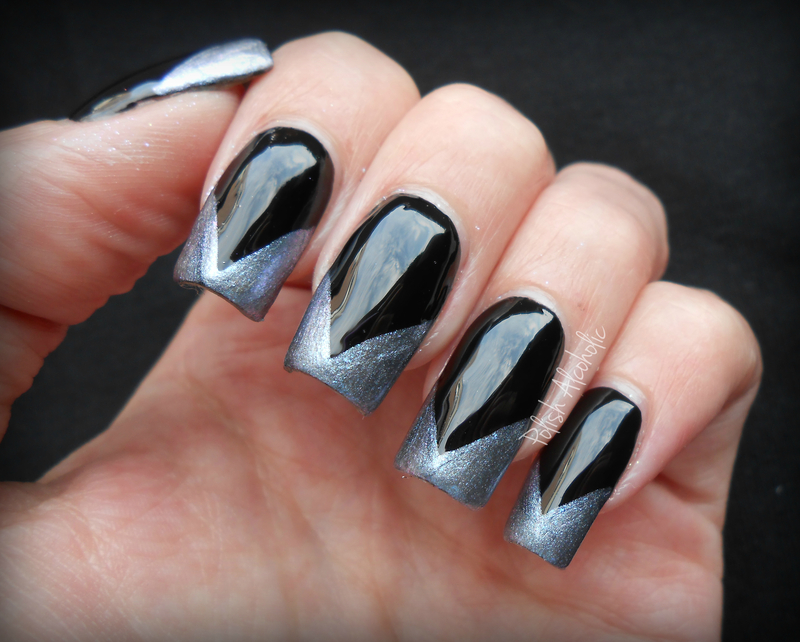 The linear holo effect isn’t very strong and shows it’s true beauty in sunlight, but it’s perfect for the soft shades. I’m so excited to show you these awesome polishes that are handmade by the lovely Jamie at In The Grey Areas. I was totally excited -read: shocked- when she e-mailed me that she was going to send me some of her creations. She sent me six polishes that were made by herself and also six other special polishes which of course I will show you later 😉 She even sent me a couple of bags with loose glitter and cute hearts. It felt like Christmas when I got them. Can’t thank you enough Jamie. They’re all L-O-V-E-L-Y! I’ll post a picture of the semi matte black polish later. So stay tuned! @ Jamie: You really need to start a Etsy shop or something like that. This needs to be seen by everybody who loves nail polishes if you ask me.